International Journal of Research in Health Sciences,2014,2,3,864-866. 1-Professor, SGRD College of Nursing, SGRDIMSR, Vallah, Amritsar, Punjab, INDIA. 2-Lecturer, Neta Ji Subhash College of Nursing, Palampur, Himachal Pradesh, INDIA. 3-Lecturer, SGRD College of Nursing, Sri Guru Ram Das Institute of Medical Sciences andResearch, Vallah, Amritsar, Punjab, INDIA. Diabetic foot is one of the most common, but unfortunately less talked about complication among Diabetic adults in our scenario. The present study was undertaken to enhance the knowledge of diabetic adults regarding foot care. 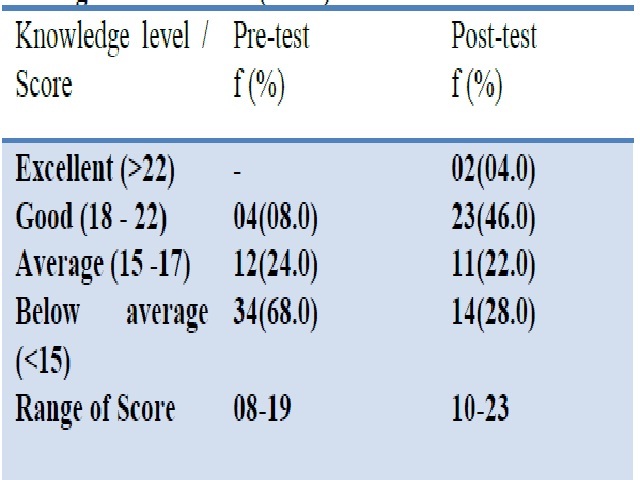 Fifty subjects were enrolled in the study and their knowledge level was assessed at the baseline. The structured teaching programme was developed and administered. After seven days, post test was conducted which revealed significant gain in the knowledge score. Hence, it is recommended that such cost effective interventions should be held frequently in chronic care selfmanagement.